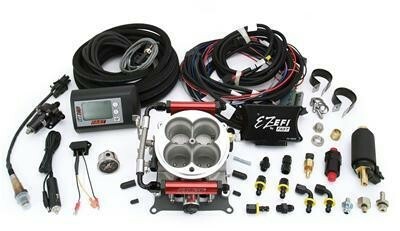 "Einspritzanlage, FAST EZ EFI Version 1.0 (mit Benzinpumpe im Tank)"
Notes: Designed for engines making less than 600 hp. These FAST EZ-EFI Master fuel injection system kits add an easy-to-install in-tank electric fuel pump to the completely self-tuning electronic fuel injection system that requires no laptop or tuning experience. They include a 255 LPH Walbro high-pressure pump featuring a lightweight, compact design that is perfect for performance applications. The in-tank pump is cooled by the fuel in the fuel tank and flows enough fuel at 60 psi to support up to 600 hp applications. The FAST EZ-EFI Master fuel injection system kits include a mini ECU, wide-band oxygen sensor, wiring harness, injectors, and 4150-style throttle body.